Who are we? What are we? Card: 30 The Green Woman – from The Heart of Faerie Oracle deck by Brian and Wendy Froud. 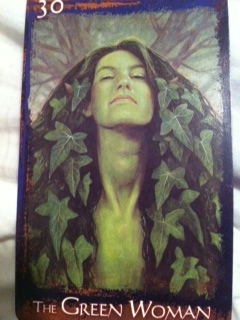 Message from the Faeries: You all have the Green Woman’s qualities within you. If you look into her eyes, perhaps you will recognize her and see something very familiar about her. We mean familiar in the family sort of way. She is your mother, your sister, your friend, your lover. She is your feminine aspect. She has an element of pride about her if you look closely. She is looking at you and she is proud of what she sees, because she sees the perfection of you. For her, when she looks at you it is like she is looking at a mirror and you are a reflection of herself. When she looks at you she is admiring her creation, which is you, which is also herself. There is also love in her eyes because she loves what she sees. She loves you, and, more importantly, she loves herself. Her love is the most warmest and gentlest kind of love, it also runs very deep in a very primordial way. Her love is also the love for all of Creation. It is such an incredibly big love! We would love for you to have this kind of love for yourself. We would love for you to look in the mirror and see what the Green Woman sees and to feel the love that she feels for you. We would really love for you to feel this deep, gentle love for yourself. You are so very much loved! We love you! Many blessing to you, The Faeries. This entry was posted in Faerie Reading and tagged Faerie Reading, Faeries, Tarot by faeriemessenger. Bookmark the permalink.